If you need to transfer funds between Cornerstone Credit Union and your account(s) at other financial institutions, it's easy with Account-to-Account Transfers. To initiate a funds transfer, you need to enroll in CU-BillPay, available through CU-Branch. In CU-BillPay, simply click the "Transfer Money" tab to initiate a funds transfer. 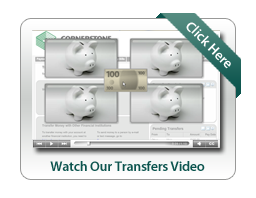 View our Account-to-Account Transfer demonstration video for more information.